"This is a healthier and not-so-sweet option for those who prefer sweet potato fries to sweet potato pies. I use organic ingredients, but it is not required!" Place potatoes into a large pot and cover with cold water; bring to a boil. Reduce heat to medium-low and simmer potatoes until tender, about 20 minutes; drain and transfer potatoes to a large mixing bowl. Beat potatoes with an electric mixer until smooth; add cream cheese and beat again until smooth. Season potatoes with sea salt. Simple mashed sweet potatoes are flavored with maple syrup and butter. Serve immediately, or transfer to an oven-safe baking dish, cover, and keep warm in an oven at 200 degrees F (95 degrees C) until the rest of meal is ready! Substitute cream cheese for the Neufchatel cheese, if desired. 4*s, but I made it into 5 by adding a 1/4 teaspoon of pumpkin pie spice! The first couple of times I made this, I followed the recipe exactly--came out creamy and delicious. I made them earlier this week and used plain greek yogurt and some honey--sooo yummy! 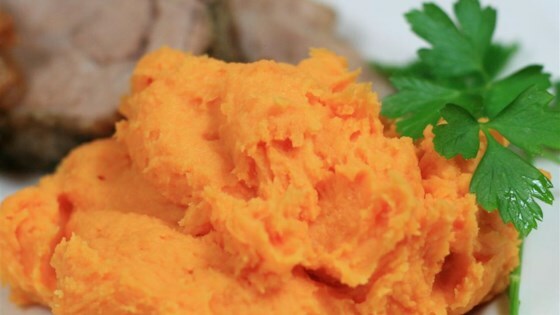 These mashed sweet potatoes are AWESOME!!! I love that these potatoes aren't overly sweet. They're super creamy and were easy to make. These potatoes were my favorite part of dinner tonight. This is so good. It was creamy and not dry at all. Our family absolutely loved it. We did not cut nor peel our potatoes, and followed the recipe. They came out great for us, creamy and smooth. Thanks for the suggestion. Easy to make and has a great texture. I would have given it 5 stars but it was a bit bland until I added a little sprinkle of pumpkin pie spice as recommended by several other reviewers.